We came to the Bronx Zoo, the largest metropolitan zoo in the U.S. I love animals. People often ask a question like "hey, are you a dog-person or a cat-person," but this question does not make sense at all to me. I love ALL the animals. I have been watching all kinds of program about animals on TV since when I was a little kid. I tried to entertain my friends who came to the zoo together with my overflowing trivial facts about animals but I scared them off in ten minutes with my nerdy detailed knowledges. But WHY?? I would love to put nerdy trivial facts on every photo but that is going to be wicked long so I will write it some other time. Each animal has some interesting stories. Maybe I can make the big animal series on this blog and keep putting up the photos and articles. We saw the tiger which is the animal of the Chinese zodiac on next year. This is a good omen. We came to Hamilton Park in Weehawken, New Jersey. I think this is the best spot to view the whole Manhattan. Evidently lots of wedding photos are shot in here. Today, we were blessed with the great autumn sunshine and could see, not only the sky scrapers, but as far as the Verrazano Bridge which connects Brooklyn and Staten Island. The beautiful scenery captivated us for a while at the deserted park in Thanksgiving. There are more photos on the links below. It's picnic with our friends. 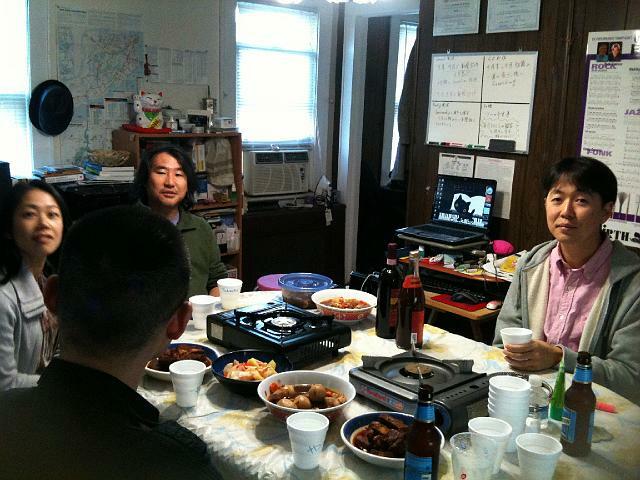 Kazuo, Yuuki, our friend Tsuyoshi and Shin-ichi , and myself. Five of us are going to Bronx Zoo. 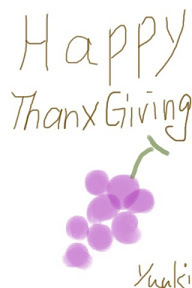 It is the last day of the Thanksgiving Weekend. Look how deserted Staten Island is. I rode out the high wave and arrived to Staten Island. The ferry terminal was packed with the tourists of Thanksgiving and I made my way trough the crowd to get to Tuttoriso. We had a very special guest today. The founding member of WaFoo, Tsuyoshi Niwa, was in New York on business and played the soprano sax with us today. His tone and the time feel were excellent as I had remembered. 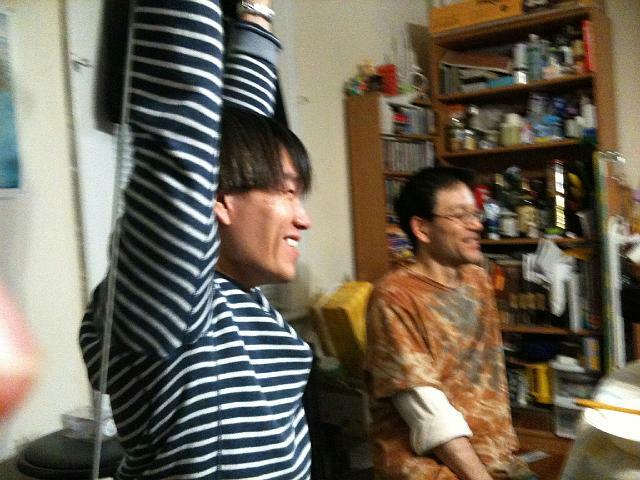 I jumped on the bass for a few tunes and enjoyed the conversation with the sounds with Tsuyoshi. We talked to each other throughly. Oh yes, we did not have any harmony instruments like guitar or keyboard today. This situation is an extreme fun for us bassists! This is the view from the Staten Island Ferry looking to the Lady Liberty and the endless blue sky behind her. Maybe you cannot tell from the picture but the wind was so strong and the water was so rough. It was quite a bumpy ride to the island today. Even though, I forced myself to stay at the deck but could not bear the salty splashes and escaped to the inside. Enough sodium for today. The all-soaked lower deck where I usually stay at. Oh well. 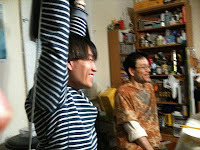 I saw the movie called "Staten Island" with Kazuo, Yuuki and our friend Shin-ichi the bassist. Staten Island is the stronghold of WaFoo and this is the least developed borough of the New York City. This place is also infamous as the big residential area for those higher-ranked gang stars and the movie is all about them. On the beginning of the movie, the narrator says, "The people who live in here are like this," and the scene moves to the guy beating the hell up another guy tied-up to a chair. Everyone, NOT all the people who live here are like that. There are nice people, there are the people who do not fire a gun indiscriminately, and there are people who do not chop off the people in pieces and bury in the ground. Hey, my friends, let's go to Staten Island! 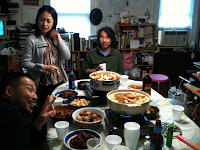 WaFoo hosted the Thanksgiving party as we do every year. This is the day for the family reunion in America, but for lots of new Yorkers who live far away from their families, this is another party time to drink and make merry. Those Japanese food was excellent of course, and we sang through the night. Takeshi and I became "strolling guitar brothers" and we all sang literally everything: Japanese old local hits to Guns 'n Roses." That was one great night. The next one is New Year party. Ha-ha-ha. I am totally a self-taught sanshin player so I always wanted to take a lesson from the real authentic Okinawan sanshin player. But how can I find that kind of skilled musician in New York City, on the other side of the world? The answer is you can't. I had to use what I had. I am a self-taught Tsugaru-shamisen player to start with, so I basically transferred all of those my poorly-immitated shamisen technics to sanshin, and had been, I mean, have been cheating on my sanshin playing since the beginning. That's going to end today. I met Kossan who was playing the sanshin in traditional style at Japan Arts Matsuri 2009 on the other day. I found out this mean sanshin player, who was also a zen monk, was teaching sanshin every week. I jumped right on and came to his class. He gave me one excellent lecture. He corrected me on everything, starting with how to hold the instrument to how to put it back in the case. We played a couple of practice tunes. I had a blast. Kossan is about to leave New York to attend at Okinawa Prefectural University of Arts for next four years. It is too bad that we just got to know each other. After the class, he talked about his own pleasant philosophy as a monk, as a person. That made me feel really comfortable. 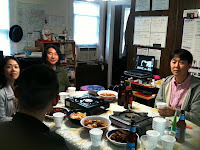 Kossan said that he would come back to New York from time to time. Kossan, please play a concert with WaFoo when you come back. I promise it will be a fun concert because all the members of WaFoo are good people. Let's not forget to mension, Kossan is having the last concert in New York titled "Kossan Matsuri (festival)" on Dec. 12th & 13th. The detail is on his web site. This is the last chance to see Kossan's performance. Don't miss it!